The recipes themselves are all over the map with their advice for making octopus tender. Salting is essential to tenderness, or fatal; brief dips in boiling water tenderize, or long slow cooling, or a rubbing with grated daikon, or the addition of a wine cork to the cooking liquid. McGee continues to perform his own experiments with which he does come up with two ways to prepare octopus. Brine/simmer and self-braise at low temp. While I am sure they both work really well, I found that sous vide is hands down the way to go. And it makes sense, because it is sort of like a self braise. One of the best things about cooking Octopus is that you can cook it at a temperature perfect for cooking vegetables. Starches break down around 80C, while pectin doesn't break down until around 85C. And when I think Octopus and starches I most certainly think of Pulpo A La Gallego. Pulpo A La Gallego is a spanish dish that is basically boiled octopus and potatoes drizzled with olive oil and paprika. It was crazy easy to do this SV-stylee. Bag of potatoes with olive oil, s&p, garlic powder and smoked paprika. Other bag is octopus tentacles with olive oil, salt and lemon juice. 180F for 4+ hours to get the octopus nice and tender. Take out potatoes and arrange on a plate. When the octopus is done, you'll have a bag of mostly octo-juice as octopus are mostly made up of said juice. Remove tentacles, retain the octo-goodness in the bag, its pretty gelatinous, reuse for a sauce. 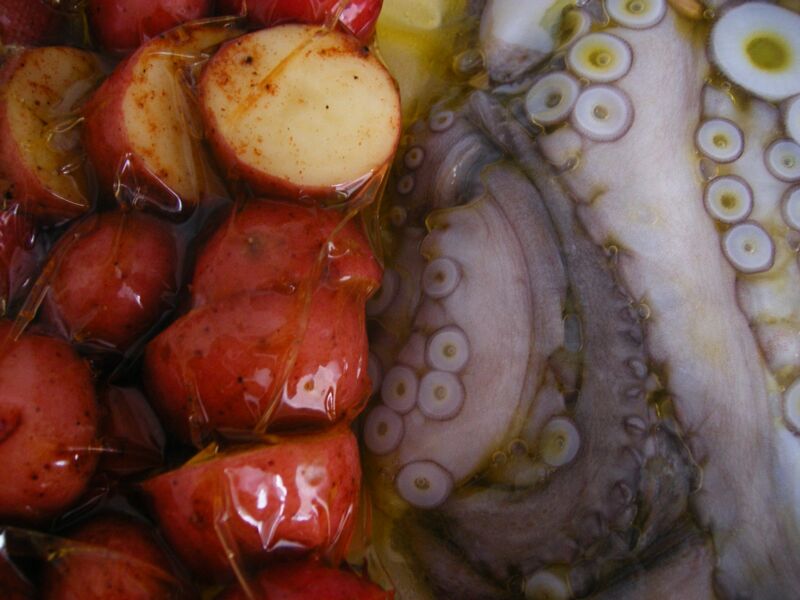 Slice tentacles, squeeze more lemon juice on them, and put on top of potatoes. A drizzle of olive oil and some paprika and boom you're done. As far as breaking down the octopus and the tentacles post water bath, sharp kitchen shears are definitely the way to go. Cut out eyes, innards, beak, removed head then cut through the webbing to get each tentacle whole.